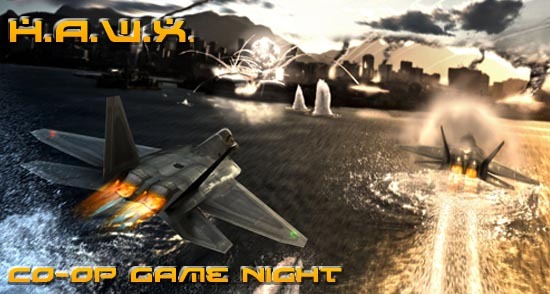 Co-Optimus - Event - Xbox Live Co-Op Night for June: H.A.W.X. 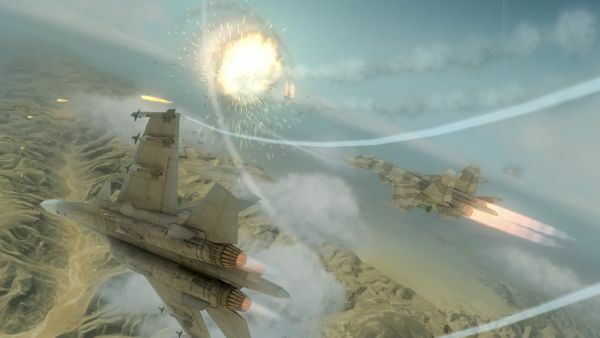 Xbox Live Co-Op Night for June: H.A.W.X. June marks our 1 year anniversary for the official Xbox Live Co-Op Nights! Thats' right, one year ago we kicked off an idea of getting gamers together to play co-op with Halo 3, and now 13 co-op nights later (we had a bonus one in there) we're still going strong! This month we're taking to the skies in Tom Clancy's H.A.W.X. and it's four player drop-in and drop-out co-op. We'll be departing gate X360 at 8PM EDT on Thursday, June 11th. To join simply sign into Xbox Live and use the built in match making to find other gamers playing co-op. You can also add gamertag cooptimus and utilize the friends of friends feature to play, or check back here on Thursday for a list of staff gamertags playing. The Co-Op Experience: Pick up a wingman - or pick up 3 as you dog fight it out with your buddies. Drop in and out of the campaign as each player can use their own planes, unlock experience, and level up their pilot in the co-op campaign. Look for Gamertags: bapenguin or Van Lingo to join up with some staff! Page created in 0.6371 seconds.